Cerebral Palsy is the name for a group of lifelong conditions that affect movement and co-ordination. This is caused by a problem with the brain that occurs before, during or soon after birth. Crebral Palsy (CP) is the most common of all childhood disabilities, affecting an estimated 30,000 children in the UK. CP occurs when there is an injury to the growing or not yet fully formed brain. Usually, injury is caused in the parts of the brain that control movements. People can be affected very differently. Some people may have only very subtle physical issues and other people may be profoundly physically disabled. Some people have typical intelligence whilst others have difficulty learning. It may or may not affect an individuals vision, hearing or speech. In some cases, you may not even realise someone has cerebral palsy and their disability may be hidden. Once the injury to the brain has taken place, it does not get worse. Symptoms may change as people grow and their bodies become bigger and heavier. CP has many causes, some of which are infections that can be caught by mothers during pregnancy, a difficult birth, prematurity (giving birth earlier), bleeding or a lack of oxygen to the baby’s brain. There is currently no cure for Cerebral Palsy although people with CP lead full active and independent lives. Cerebral People - Innovative film made by Hackney Young people with CP from Homerton University Hospital on Vimeo. In this article we will explain a bit more about it and who helps support familes and young people who live in Hackney. Click on the content bars below to find the answers to each question. Where do children with Cerebral Palsy get assessed and diagnosed? Diagnosis can occur at different ages depending on severity of the condition. It may not be possible to make a definitive diagnosis for several months or years, as some symptoms aren't obvious until a child is a few years old. This is why it is not antenatal (before birth) diagnosis. Most children who have Cerbral Palsy receive a diagnosis by the time they are 2 years old. Children who had a difficult birth or who are born early (prematurely) and need medical care following birth, will be followed up by paediatricians (children's doctor) at the INDS (Infant neurodevelopmental service) clinic at Homerton Hospital. Other children who have symptoms e.g. difficulty with moving their arms/ legs/stiffness / delay are referred to Hackney Ark, GP, Health Visitor. The Patch Clinic is a developmental clinic aligned to one of 6 localy areas (patches A-E) in Hackney. A diagnosis of Cerebral Palsy can be made either at Patch or the INDS clinic. How is my child or young person's progress monitored? Children with complex needs associated with severe Cerebral Palsy are followed up in PAC (physical assessment clinic) by the Community Paediatricians and members of the multi-disciplinary team. Children with less severe symptoms will be followed up in Patch clinic (under 5 years) or school age clinic (over 5 years) or if they are at a Special School at a school medical appointment. Educational progress is monitored by the school SENCo. Each school must have an SEND information report saying how pupils with SEND are supported and this must detail how pupils with medical conditions are supported. Schools can call in other agencies for specialist advice on particular children. All schools have a link Educational Psychologist and speech and language therapist. Children’s Occupational Therapy and Children's Physiotherapy run sessions during the Summer holidays for young people known to their services. The Cerebral People film at the top of this article was a project that came out of one of these collaborations. In the Summer of 2017 the young people worked with the services to make a wiki about living in Hackney. The project was run in 2016 with a group of Hackney teenagers who have physical disabilities and who are known to the Homerton NHS Physiotherapy and Occupational Therapy teams. This was a 6 session education project with a group of young people who have various disabilities e.g. Cerebral Palsy, Spina Bifida, Spinal cord injury, Arthrogryposis. In the first stages of the project the young people attended sessions to learn more about their diagnosis and to have the chance to meet together with other young people with physical disabilities. 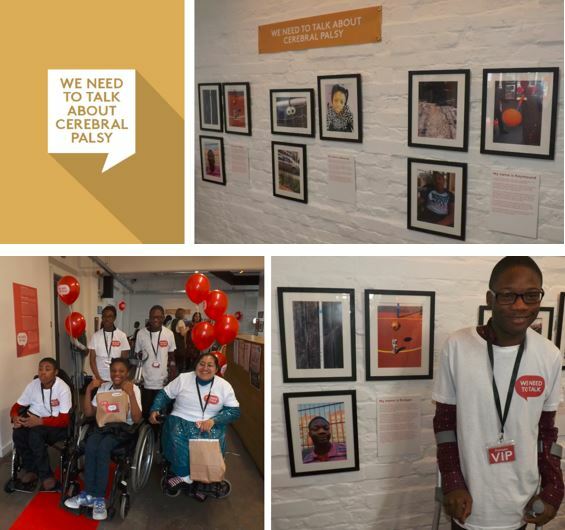 The second part of the project focused on using photography as a medium for the young people to communicate their thoughts about their disability with the aim of using the images produced to prompt thinking, educate and teach others about some of the challenges they face. The young people selected their best photographs and wrote messages to go with them that they wanted their local community to understand more about. What support services are there in Hackney? There is an agreed orthopaedic pathway for referral from Hackney Ark to the Royal London Hospital to monitor and prevent hip problems. This involves paediatricians at the Ark requesting children’s hips be x- rayed, these are then reviewed by orthopaedic doctors at the Royal London Hospital. Children are seen once and then a follow-up is arranged depending on the X- ray results and initial assessment. The options to manage spasticity and pain are also discussed with the doctors at the Royal London Hospital. These options may also including Botox. All children with Cerebral Palsy need vision and hearing checks – children are referred for these by paediatrician at time of diagnosis. They may then need follow-up depending on initial testing. Are there any parent/carer forums and support groups for young people? Children’s Occupational Therapy and Children’s Physiotherapy Service run parents group 1 -2 times a year at the Hackney Ark. The sessions explore different topics and issues for families e.g. what different services do, why we regularly assess your child using outcome measures and treatment options. CAMHS Disability Service offer a range of parent/carer support and information sessions. CAMHS Disability are part of the CAMHS Alliance which offers a range of support to families and young people.